Dr. Hilaire Ninteretse addresses participants at the national level supervision-strengthening workshop. Burundi’s National HIV/AIDS Program, Programme de la Lutte Contre le SIDA et les Infections Sexuellement Transmissibles or PNLS was created in 2011 when the Ministries of Public Health and HIV/AIDS were combined. A relatively new organization, PNLS is tasked with leading the long-term implementation the Ministry of Health’s HIV/AIDS programs. But PNLS lacks strong management and organizational capacity, which has resulted in weaker HIV/AIDS program outcomes. The HFG project and PNLS, however, have teamed up to change that. 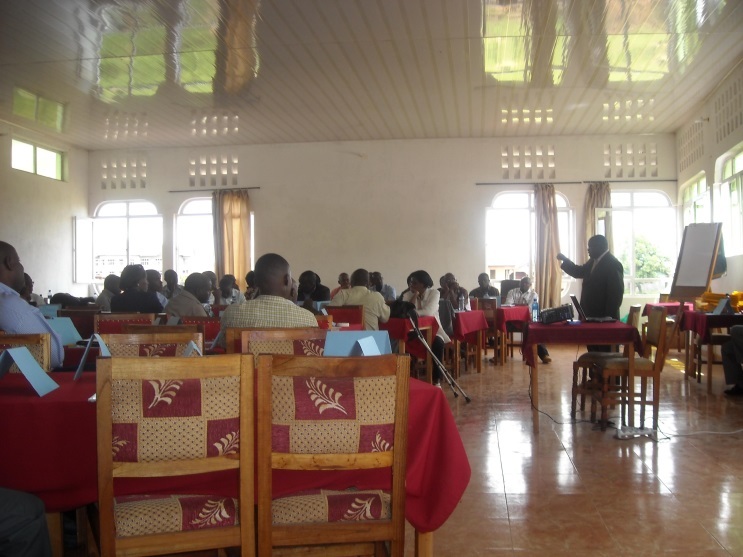 Through the HFG project, USAID is implementing a multi-year program to enhance PNLS’ management skills and support their growth as the national organization to lead Burundi’s progress towards achieving an AIDS-free generation. “Before, PNLS was an institution where each person wanted to pull the cover over himself, but with this project, team spirit has been developed and we communicate with each other,” said one staffer after the first year. Burundi’s HIV/AIDS prevalence rate is estimated at 1.4 percent for adults ages 15-49, according to the 2010 Demographic and Health Survey. However, there is particular concern about the vulnerability of women in contracting HIV. The HIV prevalence rate among women is higher than men across all 17 provinces, and among urban women it is 6.1 percent. Burundi was selected by USAID as a Prevention of Mother-To-Child Transmission (PMTCT) Acceleration Country and will receive support to scale up PMTCT services. HFG support to PNLS started by with an anonymous web-based survey of staff to conduct an overall assessment of the organization. Participation was excellent with 31 responses from a staff of 38. The assessment covered six dimensions, such as whether PNLS has a clear mandate and well defined functions, the leadership and management capacity needed, and adequate operating resources to function effectively. Based on these results, HFG staff tailored a capacity-building plan for the organization. The plan is being implemented in three phases that include strengthening basic management practices, building effective work teams, and strengthening core functions, such as operational planning, coordination of stakeholders, and training of trainers. “Leadership and management training has improved our capacity to meet our challenges. The organizational support enabled us to be considered as the principal recipient for the next Global Fund grant ”said Dr. Hilaire Ninteretse, Director of PNLS. Improved internal management practices, such as regular staff meetings, a functioning senior management team, increased involvement of the divisions, and internal collaboration across operating units. Better collaboration with the Permanent Executive Secretariat of the National AIDS Commission (SEP/CNLS) which as the Global Fund Principal Recipient is responsible for implementation of the Global Fund grant. SEP/CNLS and PNLS are the two key national level bodies responsible coordinating and implementing HIV/AIDS programs. PNLS and its partners developed and approved a new national strategy for improving supervision of HIV/AIDS activities at the sub-national level. The results of the situational analysis were presented at a national-level workshop consisting of 60 representatives from the provincial and district health offices, central health ministry staff, SEP/CNLS, and implementing partners. The national workshop proved to be an excellent opportunity for PNLS to exercise leadership in a critically important area. Updated and validated job descriptions for all PNLS staff. These job descriptions will be used by PNLS staff to help monitor and improve their performance. A 2014 operating budget was created as well as the targeted procurement of IT and office equipment improve office functions. PNLS staff had never been trained how to effectively train others – despite their critical role in building capacity at the provincial and district levels. HFG delivered two training of trainers workshops for the 12 PNLS staff often called upon to deliver trainings.